According to multiple reports, Jason Hammel, the top remaining pitcher on the free agent market, is headed to Kansas City on a two-year, $12 million deal. 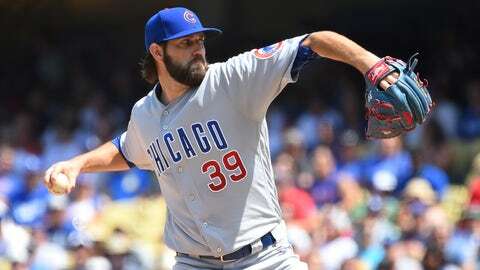 A 34-year-old right-hander who has spent 11 years in big leagues, Hammel went 15-10 with a 3.83 ERA and 144 strikeouts over 166 2/3rd innings for the Cubs last season. For his career, Hammel owns an 84-77 record with a 4.42 ERA. His best season came in 2014 when he went 10-11 with a 3.47 ERA (127 ERA+) over 176 1/3rd innings with the Cubs and the A’s. Hammel likely slots into the Royals’ No. 3 spot in the rotation behind Danny Duffy and Ian Kennedy. With Hammel in the rotation, Jason Vargas moves to the No. 4 spot and Nate Karns, Matt Strahm and Chris Young will battle to be the fifth and final starter. Whoever doesn’t win a spot in the rotation will move to the bullpen. Strahm excelled there last season in his first taste of Major League action, Karns has a big arm and Young, well he’d be ready for long relief. Who would you rather have, Hammel on the deal he’s about to sign or Charlie Morton (two years, $14 million), Edison Volquez (two years, $22 million), Bartolo Colon (one year, $12.5 million), Jeremy Hellickson (one year, $17.2 million) or R.A. Dicky (one year, $8 million)? Hammel’s reported deal with the Royals is well below the three-year, $42 million deal predicted by MLB Trade Rumors in November. And he didn’t receive a qualifying offer so the Royals don’t have to surrender a draft pick. This team’s got one more run. At least that’s what this signing seems to (thankfully) scream. Kansas City could have sat put and let Karns and Strahm/Young shore up the backend of the rotation. Instead they went out and got the best remaining pitcher available. Next: Are sluggers the next market inefficiency? Ideally the Royals’ front office makes a few more moves to strengthen the bullpen, but this sure does seem to indicate this club is making one more playoff push before some tough decisions are made on who to re-sign after the 2017 season.